The wait is finally over as the results of the 36th Golden Joystick Awards presented with AMD are revealed. The winners in 23 categories were announced today at the award ceremony held at London’s Bloomsbury Big Top and live streamed on Twitch. "2018 has been an incredible year for videogames. We have had year-defining blockbuster hits such as Fortnite Battle Royale, Red Dead Redemption 2 and God of War, sitting alongside indie breakthrough games such as Subnautica and Dead Cells. This year’s Golden Joystick Awards received a record number of voters, casting millions of votes, and we are not surprised to see all these games being recognised for their inventive brilliance and the sheer joy they bring to so many people." 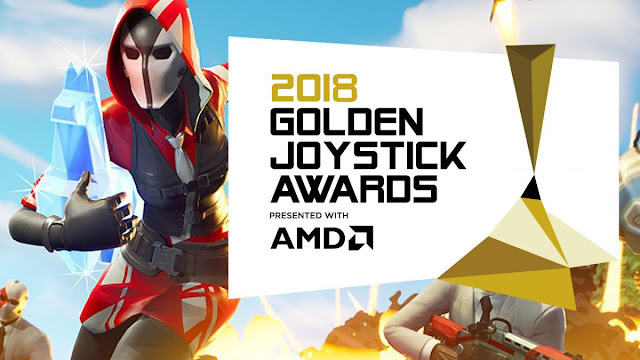 The Golden Joystick Awards presented with AMD honour the people and products that have transformed the games industry in 2018. The event features 23 categories, the majority of which are voted for by the global gaming public. The event was first held in 1983 and has grown to become the world’s largest public voted gaming awards brand. If you missed the action, you can still watch the whole show on Twitch.